The Mess Detectives and the Case of the Lost Temper by Karen Poth introduces us to the I Can Read! 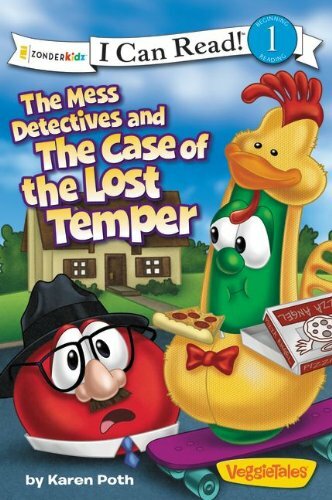 book series with some familiar faces, the cast of Veggietales. As expected, our daughter thrilled to see a new book with these beloved characters. Unexpectedly, as she is not yet three, the “short sentences” and “simple concepts” employed by the Beginning Reading Level 1 enabled her to “read” portions of the book on her own. She adores chiming in with her favorite sentences and can remember aspects of the story, even a couple days after our last read through. Highly humorous, the descriptive illustrations add much to the story. Subtitled A Lesson in Self-Control, the storyline follows Mess Detectives Bob and Larry as they search for the “Masked Door Slammer.” Somewhat hard to follow is the connection between the door slammer, a lost temper (the book’s title), and Bob’s bad mood culminating in his lost temper. Bob and Larry’s antics nevertheless help illustrate the proverb stated at both the beginning and end of the story (Proverbs 29:11). Entertaining and ideal for discussing self-control, The Case of the Lost Temper has been read multiple times in our home, with no end in sight!